Imagine one of the most trivial tasks in Excel – remove rows from Excel, for which contain the number 1 in their first column. 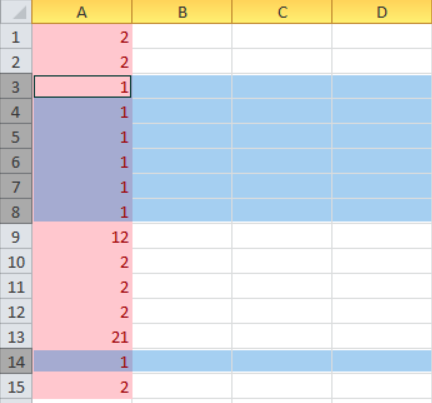 Or in the column below, these are the rows, which are selected. As you see, some rows are deleted, but not all of them. This is because once a row is deleted, Excel moves all rows with one up. 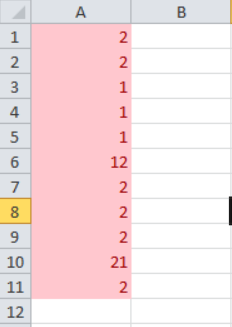 Thus, if there are consecutive rows, the second one does not get deleted. To solve this problem, you should think a bit smarter – you should loop reversely – e.g. from the 15th row to the first one. Then it will be ok to delete the row, which you have noticed. Anyway, deleting rows every time is not the best solution for a big Excel file – it means that you should execute the “delete”operation a lot of times. And deleting in VBA / Excel is a slow operation. Thus, you should think of a way to execute the “delete” once at the end of the program. VBA – How to start?